during the 2016 Oslo Jazzfestival. 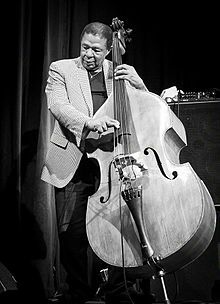 Charles Anthony "Buster" Williams (born April 17, 1942 in Camden, New Jersey) is an American jazz bassist. Williams is known for his membership in pianist Herbie Hancock's early 1970s group, working with guitarist Larry Coryell from the 1980s to present, working in the Thelonious Monk repertory band Sphere and as the accompanist of choice for many singers, including Nancy Wilson. Williams' father, Charles Anthony Williams, Sr., was a musician who played bass, drums, and piano, and had band rehearsals in the family home in Camden, New Jersey, exposing Williams to jazz at an early age. Williams was particularly inspired to focus on bass after hearing his father's record of Star Dust, performed by Oscar Pettiford, and started playing in his early teens. He had his first professional gig while he was still a junior high school student, filling in for Charles, Sr., who had double booked himself one evening. Williams later spent his days practicing with Sam Dockery, who was playing in Jimmy Heath's band in Philadelphia on a regular double bill with Sam Reed. Charles, Sr. hosted a jam session at a club called Rip's and gave Williams the opportunity to put his own group together for a Monday night show in 1959, and in an effort to work his way into Heath's band, Williams hired Sam Reed. The plan worked, as two days later Reed contacted Williams about playing in his band that coming Saturday, which demonstrated Williams' talent to Heath, who in turn hired Williams the following week. Just after graduating high school in 1960, Williams had the opportunity to play with Gene Ammons and Sonny Stitt when Nelson Boyd reached out to Charles, Sr. to cover for him. Charles, Sr. was also unable to make the gig, and sent Buster in his stead. After the first set on a Friday night, Ammons and Stitt asked Williams to join the band on tour, starting in Chicago, after playing through the weekend in Philadelphia. Williams toured with them for about a year, from 1960 into 1961, until the group got stranded in Kansas City and was abandoned by Ammons, who fled without paying the band. The rhythm section managed to work with Al Hibbler for one week in order to earn enough for train fare to return home. Williams made his first two recordings with the Ammons/Stitt group in August 1961, Dig Him! for Argo Records and Boss Tenors for Verve, both recorded in Chicago. Williams attended Combs College of Music in Philadelphia irregularly during and after his tenure with the Ammons/Stitt group. He learned composition, syntax, harmony and theory from Dr. Roland Wiggins. Williams was hired by Dakota Staton after hearing him at a gig in Wilmington, Delaware with the Gerald Price Trio in 1961. This was closely followed by work with Betty Carter in 1962 and Sarah Vaughan in 1963. Vaughan took him on his first European tour, during which he connected with the Miles Davis Quintet on the French Riviera. In 1964, Williams formed a more lasting working relationship with Nancy Wilson, with whom he recorded several albums for Capitol Records, and as a result he moved to Los Angeles. Williams would go on to work with numerous other vocalists throughout his career, including Sathima Bea Benjamin, Shirley Horn, Betty Carter, Jonathan Schwartz, Carmen McRae, Roseanna Vitro, Helen Merrill, Nnenna Freelon, Jon Lucien, Marguerite Mariama, and Champian Fulton. Williams' move to the West Coast facilitated touring and recording with Nancy Wilson as well as The Jazz Crusaders, with whom he recorded five albums for Pacific Jazz. According to Williams, he was "the number one sub for Ray Brown" during this time, playing with Kenny Dorham, recording a date with the Harold Land/Bobby Hutcherson quintet, and ultimately working with Miles Davis for several months in 1967. In October 1968, Williams moved to New York City and continued to work steadily, playing shows with Art Blakey, Herbie Mann, and Mary Lou Williams, while recording for Atlantic, Blue Note, and Prestige with artists such as McCoy Tyner, Dexter Gordon, Roy Ayers, Stanley Turrentine, Frank Foster, Illinois Jacquet, and, once again, Gene Ammons (recently returned from a seven-year stint in Joliet). Having worked with Herbie Hancock in the Miles Davis Quintet, Williams became a fixture of Hancock's Mwandishi Sextet, recording three albums for Warner Bros., Sextant for Columbia, The Prisoner for Blue Note, and two more under Eddie Henderson's name for Capricorn. The Mwandishi Sextet explored new electronic sounds in jazz and featured Williams on both acoustic and electric bass. Buster Williams made his recording debut as leader in 1975 with the album Pinnacle for Muse Records, and he went on to lead several more sessions for Muse, Denon, and Buddah through 1980. He also backed Ron Carter on several recording dates which featured Carter soloing on piccolo bass. From the 1970s onward, Williams worked steadily as a sideman for Mary Lou Williams, Kenny Barron, Jimmy Rowles, Larry Coryell, Stanley Cowell, Steve Turre, and Frank Morgan, among others. For 18 years between 1980 and 1998, Williams made only one record as leader, 1989's Something More, with Herbie Hancock, Wayne Shorter, Al Foster, and trumpeter Shunzo Ono, featuring five original compositions by Williams. He continues to perform with a rotating lineup as Buster Williams' "Something More", touring Europe in 2013 with Joey Baron, Eric Reed, and saxophonist Bruce Williams. Beginning with Somewhere Along the Way in 1998, Williams increased his output as leader into the new century, notably recording Griot Libertè for HighNote in 2004, engineered, mixed, and mastered by Rudy Van Gelder and released in the Hybrid SACD format with a 5.0 surround sound mix. In June 2008, Williams self-released Live Volume 1 exclusively as a digital download. Williams was nominated for a Grammy Award for his work with Hank Jones and Tony Williams on Love For Sale, the first of Jones' records credited to "The Great Jazz Trio". Williams also continued to tour with Herbie Hancock throughout the 1980s and 1990s, and performed at a Grammy Awards ceremony with Hancock, Tony Williams, and Bobby McFerrin. 1982 saw Williams form two important collaborative ensembles, the Timeless All-Stars, a sextet featuring Harold Land, Curtis Fuller, Bobby Hutcherson, Cedar Walton, and Billy Higgins, which recorded four albums for the Dutch label Timeless Records, and Sphere, featuring Kenny Barron, Ben Riley, Charlie Rouse, and later Gary Bartz. Sphere began as a tribute to Thelonious Monk, making their first recording for Elektra on February 17, 1982, the day Monk died, but soon incorporated the band members' own compositions along with other jazz standards. From 2010 into 2014, Buster Williams toured with Sonny Fortune, Mike Stern, and Jimmy Cobb as "4 Generations of Miles", named after a 2002 concert and recording for Chesky representing four different eras of Miles Davis bands. The original group featured Ron Carter and George Coleman in place of Williams and Fortune. The Buster Williams School of Music developed from a summer class Williams ran for the IDEA Performing Arts Center in Camden in 2012. Williams formed his own non-profit corporation to continue this work in 2013. "Something More" performed at the Portland Jazz Festival and Dimitriou's Jazz Alley in February 2014, this time consisting of Williams' former Mwandishi bandmates Bennie Maupin and Julian Priester, along with Cindy Blackman-Santana and George Colligan. Williams made a short tour of Europe in March 2014 as part of the Steve Kuhn trio with Billy Drummond. Williams worked on several film soundtracks and television commercials (including Coca-Cola, Budweiser, and Old Spice) throughout his career. The 1969 film Mackenna's Gold featured Williams on the soundtrack working under Quincy Jones. Williams reunited with Ron Carter for Alain Corneau's 1981 film Le Choix des Armes, with music composed by Philippe Sarde and performed by the London Symphony Orchestra. In the 1990s, Williams worked with Angelo Badalamenti on David Lynch's Twin Peaks: Fire Walk with Me and with Terence Blanchard for the Spike Lee film Clockers. Williams made several television appearances as well, performing five of his own compositions with Branford Marsalis' The Tonight Show band, and backing Erroll Garner during an earlier Tonight Show appearance. He appeared on The Andy Williams Show with Nancy Wilson, with Bill Cosby on The Joan Rivers Show, and with Joe Williams on Sesame Street. Williams appeared as himself in the 2004 Steven Spielberg film The Terminal, playing in Benny Golson's quartet with Mike LeDonne and Carl Allen. Williams was married in 1965 to Veronica, whom he met in junior high school, and as of 2014, he lives in Camden with his wife. Introduced to chanting Namu Myōhō Renge Kyō by his sister in 1972, Williams and his wife took up the Nichiren Buddhist practice after she suffered a concussion in a car accident, and he has continued the practice ever since as a member of the global Buddhist association Soka Gakkai International. His 2004 album Griot Libertè was inspired by another health crisis when Veronica recovered from a coma following a heart attack. In addition to his Grammy nomination, Williams was awarded a National Endowment for the Arts grant for composition as well as a New York Foundation for the Arts Fellowship Grant in 1991. Williams has also been recognized by the Min-On Concert Association, RVC Corporation, and Soka Gakkai International. The Penguin Guide to Jazz on CD declared Buster Williams "one of the key sidemen in modern jazz" with "a rock-solid grounding in harmony, counterpoint and orchestration." The guide observed that "Buster's harmony is impeccable and he has a rhythmic sense that is unfailing, feeling and utterly original." Critic Ron Wynn ranked the Mwandishi Sextet "among the finest jazz-rock and pop-tinged units of all time." Critic Thomas Conrad praised Williams' work as a leader in his Down Beat review of the 2001 album Houdini, stating that the album "could in fact be taken as a clinic for bassists on how to assume a more proactive, forward position in an ensemble without throwing it out of balance," and that "in [Williams'] hands, the bass is a fully articulate solo voice." Williams' instrument is a copy of a late-1800s Boosey & Hawkes Panormo, using La Bella strings and a Fishman BP-100 pickup, with a 1x15 Polytone Mini-Brute bass amp. Sassy Swings the Tivoli (Mercury, 1963) as "Charles Williams"
^ Yonke, David. "Buster Williams brings New York jazz to Toledo". Toledo Blade, November 16, 1993, p. P-1. Retrieved June 1, 2013. ^ a b c d e Colligan, George. "The Buster Williams Interview", Jazz Truth. Blogger, July 7, 2013. Web. February 19, 2014. ^ a b c d e f g h i j "Biography" Archived 2012-01-25 at the Wayback Machine, Buster Williams website. ^ a b c d e f g Ginell, Richard S. "Buster Williams|Biography" AllMusic. Web. 01 Mar. 2014. ^ a b c d Wynn, Ron. "Buster Williams: Blendability." JazzTimes, April 2001. Web. March 19, 2014. ^ Pittsburgh Press. "Jazz Pianist Opening Here Monday". October 19, 1974, p. 11. Retrieved on June 1, 2013. ^ Palmer, Robert. "Jazz scene is now devoid of bands". Times Daily, January 15, 1984, p. 10E. Retrieved June 1, 2013. ^ Hentoff, Nat. "Cookin' at the Cookery". The Village Voice, March 21, 1974, p. 47. Retrieved on June 1, 2013. ^ Murthi, R.S. "Man with the lyrical horn". New Straits Times, June 17, 1990, p. 18. Retrieved June 1, 2013. ^ Henry, John. "SACD/DVD-A Jazz Reviews 10/04". Audiophile Audition. October 2004. Web. March 4, 2014. ^ Yanow, Scott. "Artist Biography by Scott Yanow". AllMusic. Web. March 4, 2014. ^ Santella, Jim. "George Coleman, Mike Stern, Ron Carter, Jimmy Cobb: 4 Generations Of Miles (2002)". All About Jazz. October 1, 2002. Web. March 4, 2014. ^ a b "Buster Williams School of Music | About". Buster Williams School of Music. 2014. Web. March 4, 2014. ^ Barros, Paul de. "Cecile McLorin Salvant, Julian Priester Shine at Portland Jazz Festival". The Seattle Times. February 24, 2014. Web. March 4, 2014. ^ Boccella, Kathy. "Jazz Legend Buster Williams Brings His Groove to Abington Friends". Philly.com. Interstate General Media LLC, February 5, 2013. Web. March 4, 2014. ^ a b Sewell, Rhonda B. "Emergency inspires jazz bassist's new CD". Toledo Blade, September 15, 2004, p. D3. Retrieved on June 1, 2013. ^ Monica Piccini "The Way I Do Kosen-Rufu". Buddismo, October 12, 2008. Retrieved on August 24, 2014. ^ Cook, Richard, and Brian Morton. The Penguin Guide to Jazz on CD, London: Penguin, 2000. ^ Conrad, Thomas, "Buster Williams Trio: Houdini", Down Beat, November 2001: 69-70. Wikimedia Commons has media related to Buster Williams.